Introduced in 2008 at the Melbourne International Motor Show, the Holden Coupe 60 concept was built to celebrate 60 years of car building at Holden's Port Melbourne plant. 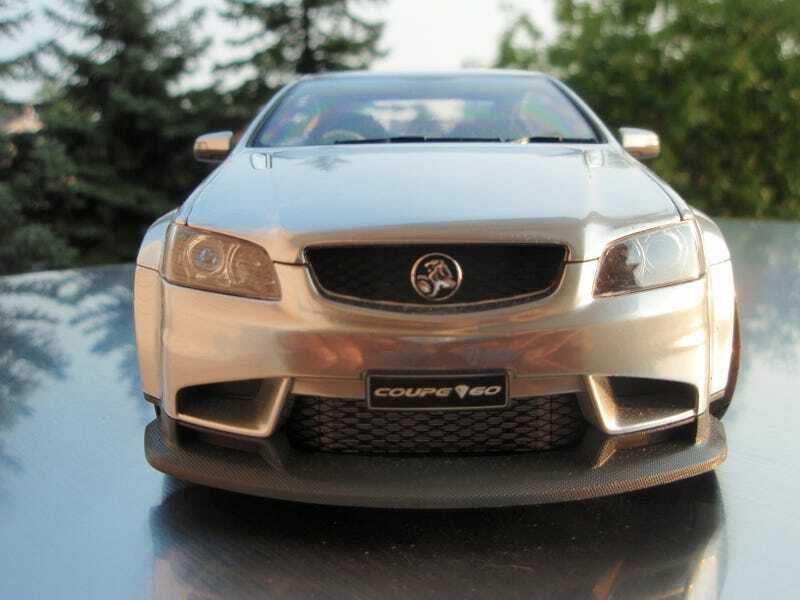 Built on the VE (Zeta) platform, it was thought that this would signal the return of the Monaro, but if it was ever offically planned, it never materialized. As a 1-off concept, I can only judge against what pictures are available, but everything looks spot-on. The lower radiator opening is perforated, but the upper grill, as well as the hood and fender vents are not. The wheels and tires are done well, and the rotors rotate with the wheel, but that is expected at the price range. The rotors unfortunately are plastic and look it. But that is forgiven the moment you open the hood. Among my models with LSx powerplants, this is in the top 3. Get a flashlight and poke around, and you see enough to believe that a fully 3D engine rests under the hood. Moving inside, the interior appears to be fully faithful to the concept. The seats and steering wheel have the look and feel of Alcantara and the button labels and readout on the radio's screen are fine enough to be read. The one downside is that the seatbelt buckles are molded into the plastic belts. This thing has some of the tightest gaps I've seen on a model. The Diamond Silver paint does a convincing job of looking like liquid aluminum, but there is a flaw on my example. I wish I knew more about the paint process, but the flawed area looks like regular silver paint and looks like it wasn't polished. But viewed at an angle, it's as shiny as the surrounding paint. Of particular note is the mounting of the lenses for the lights. CC has done an admirable job in hiding the tabs that hold the lenses to the car. The doors open on real aspect hinges and the hood and trunk are held open with struts. In terms of features, this is just a basic model. I think I paid about $100 for this when it came out, and it compares well to the comparably priced Kyoshos and Minichamps of the day. Expect to pay over $200 now. This was an LE of 4,550. That may not seem like the lowest of production runs, but unlike some others (looking at you Minichamps) they can't whore out the mold with 10 different colors. Should you get it? No one else is going to make this model in this scale, so if this is what you want, there is nowhere else to go.